A six weight fly-rod, nine feet long is ideal. I am able to supply for my clients, Sage Rods. 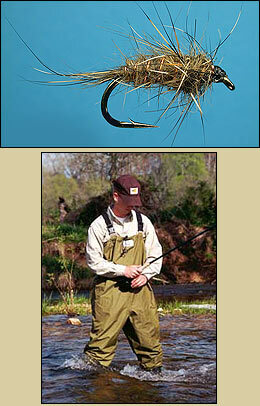 Because of the clarity of the water, you should avoid bright coloured fly-lines such as white or yellow. An olive or some other "earthy" colour is best, and weight forward lines are the most used configuration. Long leaders are pretty well essential. A twelve foot tapered leader with a 5/6 lb point is fine. You will need to attach a tippet of 4/5/6 lb about four to six feet long. Standard North American patterns work well here, but you will need to be able to 'match the hatch' in some of our spring creeks with local patterns. Adams, Royal Wulf. Humpies in various colours, Elkhair cadis are all used here. Nymphs should include, stone flies in brown and green, hare and copper, gold-ribbed hares ear, caddis in brown and green and this can be supplemented with a few local patterns. If you feel the cold, light weight breathable waders are a good idea for October and early November. Felt soled wading boots are now prohibited in New Zealand, but I can outfit my clients with the appropriate rubber soled wading boots for a small charge. In our hottest months, we often wear shorts and wading boots, (there are no snakes in New Zealand). We do have a small and somewhat annoying insect called a sandfly, (among other things more colourful). If these annoy you during the hottest months, you can wear poly-prop longjohns, (preferably in green), under your shorts then add your wading boots. Gravel guards are a good idea too. In general you will catch more fish in neutral coloured clothing, ie. olive, dark greens or browns. (I personally wear camo, and find it perfect), but you should avoid bright colours. Last and nor least, a broad-brimmed hat is good as the sun can be very strong here at times and a pair of AMBER coloured, polarized glasses or clip-ons are essential. We have done a great deal of experimentation with various colours of fishing glasses, and nothing comes close to amber (pale yellow), for all round conditions of light.